Hasani Campbell, who uses braces on his legs to walk, was last seen Monday. 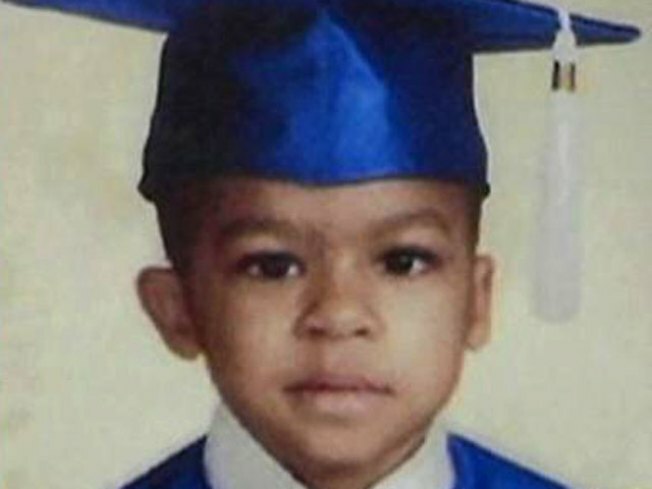 The foster parents of a missing 5-year-old Fremont boy were arrested for murder Friday afternoon in connection with his disappearance, Oakland Police said. 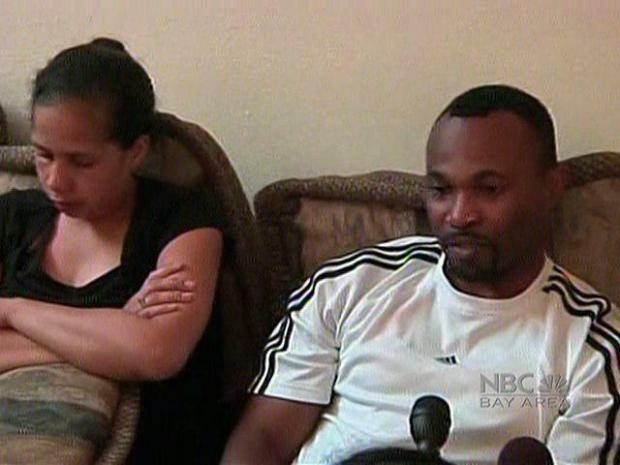 Oakland Police spokesman Jeff Thomason said Friday that Hasanni Campbell's aunt Jennifer Campbell and her fiancee Louis Ross were arrested. Oakland police say that Ross was booked into Alameda County Jail in Oakland on the charge of murder with no bail. He will be arraigned on Tuesday. Campbell has been booked on accessory to murder at the Santa Rita Jail with the bail at $15,000. She will be arraigned on Monday. Hasanni was reported missing from the parking lot of the Shuz of Rockridge shoe store in the 6000 block of College Avenue in Oakland at about 4:15 p.m. on Aug. 10. Authorities are releasing few details other than the foster parents of 5-year-old Hasanni Campbell have been arrested for murder. Campbell works at the store and police say Ross was the last person to see Hasanni before he disappeared. Police have served multiple search warrants as part of the investigation into the disappearance of the boy and the boy's foster father turned over a sword to investigators, a police spokesman and an Oakland attorney said last week. 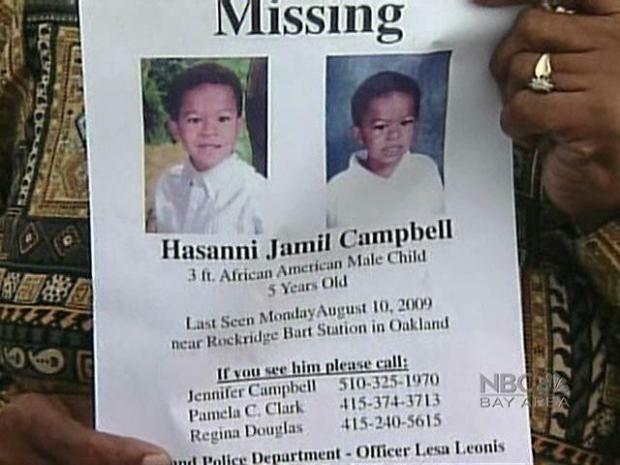 Hasanni had been living with his foster parents, Ross and Jennifer Campbell -- who is also Hasanni's aunt -- at a home on Roxie Terrace in Fremont before he was reported missing. Loius Ross says he wants to set the record straight about questions surrounding his actions in the case of his missing son, Hassani Campbell. Police spokesman Officer Jeff Thomason said last week at least one of the search warrants was served at the Roxie Terrace home, but he declined to disclose what police were looking for there. "The sword is something I keep underneath my bed." Ross told NBC Bay Area earlier. "The sword was initially put in the closet, to be honest. But we had some incidents, a couple of incidents where somebody was setting off our alarm while it was in our garage." Investigators gave Ross a polygraph test but he failed it. He says the test was fraudulent. Ross initially responded to the polygraph result by calling them a fraud. "They gave me five questions. Three were controls. The controls was: Is my name Loius Ross? Am I 38-years-old? Do I live in Fremont? Then they asked two other questions around the case. They showed me results that said I was 99 percent deceptive." Ross detailed. "So he told me I didn't even get my name right."